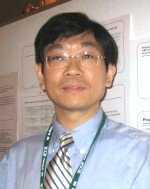 Dr. Kuo completed his MPH degree at the Harvard School of Public Health in 2002 and clinical training in geriatric medicine in 2003. His research interest is mainly about the relation between cardiovascular risk factors, small vessel disease of the brain (leukoariaosis), and various geriatric syndromes, particularly cognitive impairment and physical function limitation. Dr. Kuo's current research activities are mainly with the NHRI by performing a 2-year follow-up study based upon the participants registering for the annual Health Examination for the Elderly at the Kong-Kwan Branch of the National Taiwan University Hospital. Clinical information such as carotid ultrasound, brain magnetic resonance imaging, as well as comprehensive examination of selected geriatric syndromes such as cognitive impairment, gait/balance disturbance, falls and depression was collected. Kuo HK, Liao KC, Leveille SG, Bean JF, Yen CJ, Chen JH, Yu YH, Tai TY. The relations of homocysteine levels to quadriceps strength, gait speed, and late-life disability in older adults. Journal of Gerontology: MEDICAL SCIENCES. In Press. Kuo HK, Yen CJ, Bean JF. Association of Cardiovascular Fitness and Levels of C-reactive Protein: Data from the National Health and Nutrition Examination Survey (NHANES) 1999-2002. International Journal of Cardiology. 114(1): 28-33, 2007. Kuo HK, Leveille SG, Yen CJ, Chai HM, Chang CH, Yeh YC, Yu YH, Bean JF. Exploring How Peak Leg Power and Usual Gait Speed Are Linked to Late-life Disability: Data From the National Health and Nutrition Examination Survey (NHANES) 1999-2002. American Journal of Physical Medicine and Rehabilitation. 85(8): 650-658, 2006. Kuo HK, Bean JF, Yen CJ, Leveille SG. Linking C-Reactive Protein to Late-Life Disability in the National Health and Nutrition Examination (NHANES) 1999-2002. Journal of Gerontology: MEDICAL SCIENCES. 61A (4):380-387, 2006. Kuo HK, Jones RN, Milberg WP, Morris JN, Lipsitz LA. Cognitive Functions in Normal-Weight, Overweight, and Obese Older Adults: an Analysis of the Advanced Cognitive Training for Independent and Vital Elderly Cohort. Journal of the American Geriatric Society. 54 (1): 97-103, 2006. Kuo HK, Sorond FA, Chen JH, Hashmi A, Milberg WP, Lipsitz LA. The Role of Homocysteine in Multi-system Aged-related Problems: A Systematic Review. Journal of Gerontology: MEDICAL SCIENCES. 60A (9): 1190-1201, 2005. Kuo HK, Yen CJ, Chang CH, Kuo CK, Chen JH, Sorond FA. Relation of C-reactive protein to stroke, cognitive disorders, and depression in the general population: systematic review and meta-analysis. Lancet Neurology. 4 (6): 371-80, 2005.